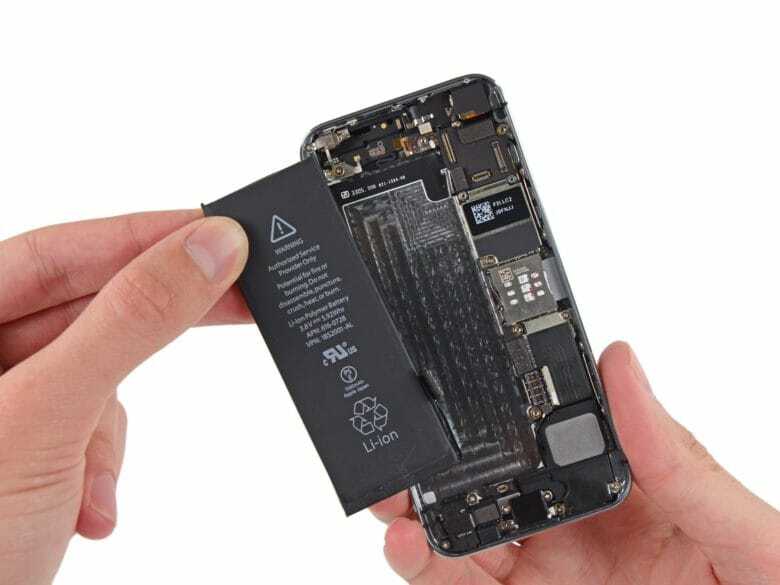 With all the fuss about depleted old batteries slowing down iPhones, it might be a good idea to at least check the health of your iPhone’s battery. To do this, you can use a free tool called coconutBattery. This handy app digs into your iOS and Mac devices to tell you how old they are, and how strong your battery is compared to when it was new. 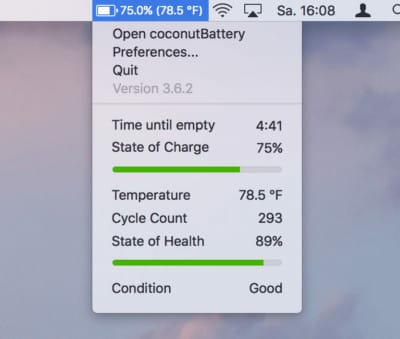 coconutBattery is a Mac app that performs a single task — it checks the status of the battery in your Mac, or the battery of any iDevices connected to that Mac. To use it, you just plug your iPhone or iPad into your Mac, and make sure that it trusts the host computer (if you regularly sync your iPhone with your Mac, you can skip the “trust” step. If you don’t, then just follow along with the instructions that will appear on your Mac and iPhone’s screens). All you need to know about your iPhone battery in one place. 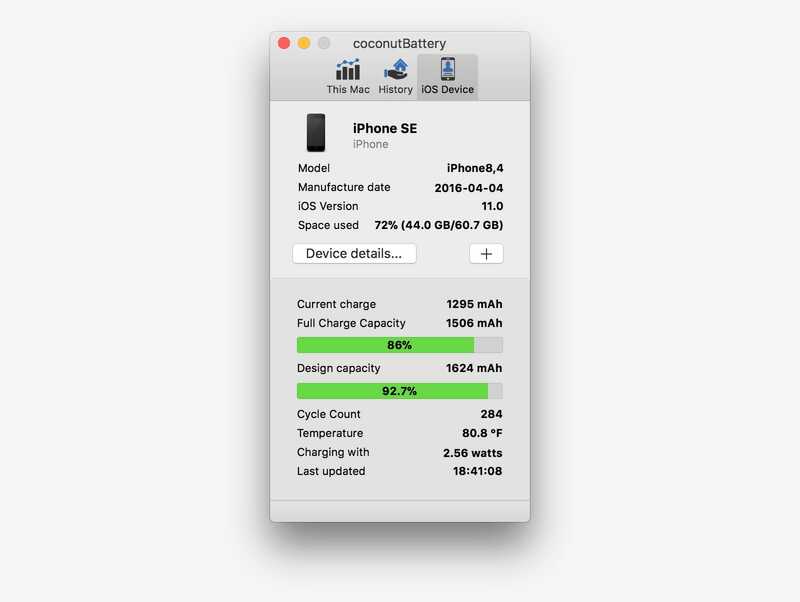 That’s the iOS page of the coconutBattery window, and it shows you several pieces of useful info. The top section is basic data about the connected iPhone (or iPad): date of manufacture, OS version, device model, and the storage space currently used. For more details — serial number, age in days, and the current kind of charger connected — click on the Device details… button. Below that is the section we’re interested in: the battery details. Here you will see two bars, hopefully both green. The upper bar shows you the current charge level of the battery (similar to the percentage readout on the iPhone itself), along with the current charge, and the full possible charge capacity in milliamp hours (mAh). Below that is a bar showing the current capacity versus the “design capacity.” That is, it shows you how much charge your iPhone’s battery can hold today, as opposed to how much it could hold when it left the factory. (The design capacity is the official spec for you device — the actual capacity when new could be slightly over or under that number, but it is a good guide). Thus, you can see just how weak your battery has become over the years. You can also see how many charge cycles the battery has been through. coconutBattery also works on the Mac. If you are running coconutBattery on a Mac with a battery, i.e. a MacBook, then you can see this info for your laptop’s battery, too. And you can also save the current data in order to keep a record of your batteries’ depletion over time. And finally, a coconutBattery Plus upgrade lets you check iOS batteries wirelessly and unlock battery charge notifications. You also get advanced viewers for Mac and iOS in the premium version. There are several tips you can follow to keep your battery healthy for as long as possible. Apple has a section of its support site dedicated to just that, and it’s a great read if you want the truth about batteries from the source. After all, who would know better about battery life and health than Apple, a company obsessed with optimizing battery performance so it can make its devices ever smaller? Check it out, and maybe you’ll be able to make your current iPhone last a little longer.